Indispensable baseball throwing drills. Unique secret tips only the pros know. The best professional baseball coaches know how to teach baseball throwing drills. If you know how to shoot a bow and arrow you will too. So many youth baseball coaches, instructors and parents instruct players how to throw ineffectively. The adults mean well and are really trying to help and mentor their players. They just lack the professional baseball secrets of outstanding throwing fundamentals. Dedicated coaches watch baseball training videos. They attend clinics and send their players to summer camps. Coaches will share their knowledge of baseball coaching tips with the players.They will plan their baseball practice drills with throwing methods. Unfortunately, the workout routines and youth baseball drills they share with players are not the highest quality. There are three important strategy elements for best practice throwing baseball fundamentals. Arm strength is largely God given. Some players will have better natural throwing arm strength then others. Why can one pitcher throw 95 MPH and another pitcher only 75 MPH? Mostly because you are born that way. Our Proper throwing technique drill will guarantee superior throwing results. You will throw at the highest ability level possible for your talent. It will also allow you to throw with sound fundamental mechanics. Your arm will have less wear-and- tear, which helps you avoid arm injuries. The speed of the game increases the higher you play. Professional baseball is played at a very high caliber and speed. Through baseball evolution players have to field the ball and get rid of the ball quickly. If the youth ball players do not learn how to get rid of the ball they will not be around very long. Or will play positions like designated hitter or leftfield if they have a good hitting skills. Our baseball fielding drills always start with our basic throwing drill. The drill immediately puts the infielder, outfielder, catcher and pitcher in position to get rid of the ball quickly without rushing, panic and hurrying. "Hit em In the Chest"
Note the picture second from the right with the youth league player in the bow and arrow throwing position. A superb example of baseball throwing drills sequence. 3. Throwing accurately. Hit em the Chest. Coaching baseball requires good defensive baseball throwing drills. Baseball throwing drills for kids almost always involvecatching and throwing. In order for youth players to play demanding positions that require a high level of throwing accuracy they have to be fundamentally sound. Successful position players that throw with accuracy are vital to quality team defense. Try our drill to dramatically deliver more accurate throws by your players. Add all these three elements together and you have a pretty good ballplayer. How do I teach the Drill? As a baseball coach, how do you teach a baseball drill to improve your players throwing. How do you teach youth player to throw hard, get rid of the ball quickly, and throw accurately? 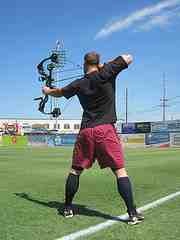 Turn your players into Robin Hood. Simply copy shooting a bow and arrow. The player’s throwing arm will immediately move to the similar position as pulling the bow string back. As soon as the fielder catches the ball and gets their fingers to grip the ball they immediately move the arm to the bow and arrow position. The front elbow is pointed at the throwing target. The glove hand is relaxed near the chest area. You are really coaching youth baseball if you can mentor and teach your players to look like Pablo Sandoval when they are making throws. This is far and away the best, quickest and most powerful throwing position to work from. So many youth sports coaches and instructors teach players to point the glove arm straight forward and the throwing arm straight back. They look like a scarecrow. The scarecrow baseball throwing drill position is simply not the best practice strategy for throwing and hampers ball players development in the long run. After you have all your players paired up, spaced safely apart and are ready to begin playing catch…prompt the players to “pull the bow back” and have them freeze in that position. Check each one to see if they are correctly pointing the front elbow of the glove arm to the target. Secondly, check the throwing arm to see if it resembles and mimics a bow and arrow position.You can them have them complete the throw at a short distance or have them stop and relax. Repeat the drill for the players’ partners. Check for the coaching points. Continue to mentor and re-teach this throwing drill constantly… it may take awhile. Nothing looks worse than a player with poor baseball throwing drills and fundamental mechanics. Pro scouts have an eye for polished baseball skills. They can quickly pick out the polished from the unpolished. This is the first step to put your players in position to throw hard, quick and accurate.